I've made no secret of it on this blog (or in life) -- I was a theater kid. I started doing theater at 4 years old (I was the Youngest Royal Child in a production of The King and I, which you can read all about here) and the acting bug got me good. From playing Jiminy Cricket in Pinocchio to the title role in Annie, I couldn't get enough. And that led to me playing one of my favorite roles: Lady Westholme in a production of Agatha Christie's Appointment with Death. Now, I know this is a role that wouldn't really ring a bell with most people. During my senior year of high school, I was the Vice President of the Drama Club (I know, I know, I was super cool and popular because of this). The best part of holding this position was that I got to help pick the plays for the year. I spent my summer balancing work for my honors classes (yes, I'm making myself sound even cooler) with reading play after play and trying to decide what our Drama Club should do. The four officers finally landed on Appointment with Death because it was mysterious, intriguing and really hilarious. I knew all along that I wanted to play Lady Westholme. The character was dry, sarcastic and funny, and she was also British, which just made her seem so much more exotic to me. 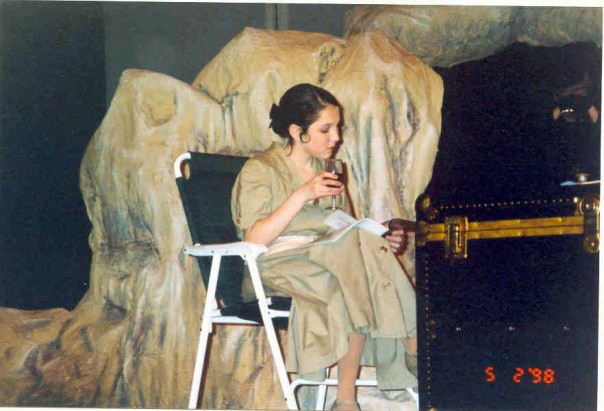 Playing this role was definitely a highlight not just of my time in high school theater but of my entire theater career. Love the picture! What a wonderful experience! awww! I was in one stage production in high school - The Crucible. I was Mercy Lewis hah! Oh how cool! I always wanted to be in that show but my theaters never did it. Love this look into your youth. Thanks for sharing! What a fun throwback! Thanks for sharing! Why do I sense that you are inherently talented and creative? I'm glad to know you did these things when you were young. Fun times! Aww, thank you Kath! I definitely try to keep busy and like to have different creative outlets. Great post! I was always too shy do drama in high school but I wish I had gotten up the nerve. Thank you, Bailey! I don't think it's ever too late to try theater. There's always community theater if you want to start! I love how your hair looks! I agree that you should do that for the blog! Aww, thank you! Maybe I will have to try a tutorial! How awesome! I always wanted to do theater, but never had the outgoing personality to do it! Too shy! I don't think my family and friends would ever classify me as shy when I was growing up. But I don't think it's ever too late to try, if it's something you are interested in!